In my haul I mentioned how I owed the products to numerous beauty blogs I have been scouting. But I thought I should give credit to each and everyone today. First comes the credit for me investing in good nail paints, the big three free, the ones that make your manicure at home last longer and give lovely results to see. I found out about Jordana making toluened and DBP nail paints from Tanveer's blog. I had a powder bronzer from them that I loved, but just did not know how many products Jordana made till I chanced on Addicted to Blush. And absolutely never could imagine they will go eco friendly. Ever since I started blogging I found my self putting on lippies several times in a day, or an hour only for a simple tutorial, where the light was playing up and not letting the colour show the way it looks. So here is what I do, I start with removing whatever lipstick I have on. Then I scrub my lips with my home made lip scrub. Wipe off the scrub. And put on a thick layer of honey on your lip, if you have been using matte lippies this will provide the much needed hydration. The lipscrub does have some honey, but this is lip spa remember. So pamper your self. Wipe the honey off with a damp towel (dipped in warm water). This will further exfoliate your lips. Now just apply some lip balm. And smile away. Start with steaming your face so that the pores are opened up, using a cotton wool dipped in any cleansing lotion, or even plain milk cleanse your skin. Now splash some water (preferably warm) on your face. Dab dry. So I am back with a post on hair , makeup and beauty in the 90s. In all honesty 90s always gets a tough rap on its knuckles for being so over the top. Largely for being blindly imitative of american makeup in 80s. But the 90s had their moment too. It did have some makeup that was not that bad. Yes most of the makeup was over the top, but some of it was pretty good. Here is my checklist of some of my favouritest or not so well loved looks from the 90s. Thats Madhuri Dixit in Dil and she is the one who best captures the reasons for the bad press 90s makeup got. The pimples, the pancake makeup to conceal them, the wierd lipstick and huge lashes didnt help, neither did helmet hair. I think a bit more attitude would help carry off the helmet head effect better. Ik of Makeup monologues is holding a sigma brush giveaway. 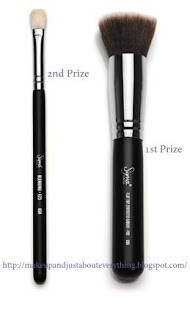 And though I have never used any brush other than Vega , largely for the cost reason, I would love to win an expensive brush. I am sure hoping to hone my makeup skills with the brushes. Fingers crossed people. Blend all the ingredients together and apply on clean skin. (you can steam your face and neck area for about 2-3 minutes before putting this pack on to help the pack sink in well ). Wash off after 20- 30 minutes using warm water. For those with dry skin they can add two tablespoon of milk to one mug (bath mug)of warm water and use this to wash off the pack. Its been a long time since I did a skin care post. So here is my at home facial. This is one of my cheapest facials and it works wonders on my skin. 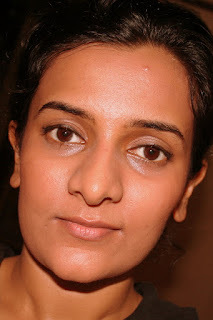 I do have oily skin, but I will give pointers here on how to make it dry skin friendly. This facial consists simply of two packs applied back to back. In this post I will give the recipe for flower pack. As easy as that. Take the petals apart from both the flowers (rose and marigold), mix in the basil and mint leaves, add a teaspoon of multani mitti (or any clay will do) run this in a mixer. If you have oily skin add some tea* to make a smooth paste, for dry skin use milk instead. Apply this on well cleansed face and neck. Leave for 20 - 30 mins and wash off with warm water.